Speaking at the AFT’s biennial convention at the Minneapolis Convention Center this summer, Hillary Clinton drew big cheers and rounds of applause when she detailed a vision for public schools and the public sector that focused on well-resourced institutions, effective community connections, and solid school strategies forged in partnership with educators and public employees. “I want to thank you for being one of the essential partners for everything we need to do to move the country in the right direction,” the Democratic presidential nominee told the more than 3,000 educators, healthcare workers, public sector employees, and guests who filled the convention hall for her address. “When I’m president, you will have a partner in the White House, and you will always have a seat at the table,” she said. Later, delegates voted resoundingly to endorse Clinton in the general election. Minnesota is launching a first-ever round of state-funded preschool. AFT affiliates are among the many groups calling the expansion a necessary start that demands aggressive follow-through by the state legislature so that more kids can benefit. A total of 74 districts will share in the $25 million preschool appropriation, Governor Mark Dayton announced in August. The funding will allow 3,300 children to enroll in free, voluntary prekindergarten. However, Dayton was adamant that the program must grow—applications from more than 100 districts were turned down due to lack of money. “The fact that more than half could not be funded, to me, is the impetus for why the program needs to be expanded,” Dayton told reporters. The New Jersey Board of Education voted in August to make the Partnership for Assessment of Readiness for College and Careers (PARCC) exams mandatory for high school graduation, starting with the class of 2021. The action means that this year’s eighth-graders must pass PARCC language arts and Algebra I tests, in addition to a minimum list of required credits, to receive their diplomas. Prior to the vote, hundreds of parents, teachers, and groups aligned with the testing “opt-out” movement submitted comments opposing the move. Read more at Diane Ravitch’s blog. Fulfilling the promise of the Every Student Succeeds Act, securing the professional rights and status of AFT members, and working to elect Democrat Hillary Clinton as the next president were just some of the major resolutions and policy statements adopted by delegates to the AFT’s convention, July 18–21 in Minneapolis. The 2016 policy statements, along with prior convention resolutions, are available online. The Pennsylvania Supreme Court ruled in August that the Philadelphia School Reform Commission (SRC) has no authority to cancel the collective bargaining agreement with teachers in the city or change the contract’s terms and conditions of employment. The court’s unanimous decision upholds a lower court decision and is “a total and complete repudiation” of the SRC’s efforts to undercut contract protections for Philadelphia teachers, says Philadelphia Federation of Teachers President Jerry Jordan, who is also an AFT vice president. Additional coverage is available online. The AFT, along with several states and education groups, is calling on federal officials to rework draft regulations tied to the Every Student Succeeds Act (ESSA), the law passed in December 2015 that replaces No Child Left Behind (NCLB). “The AFT does have some major concerns that parts of the proposed regulations walk away from ESSA’s promise of flexibility and opportunity,” AFT President Randi Weingarten wrote to Education Secretary John King in August, highlighting areas where federal regulators should make changes to avoid enshrining NCLB’s punitive excesses. AFT affiliates in 10 states also have submitted formal comments to the Education Department. The Economic Policy Institute’s latest report on teacher pay shows a growing compensation gap. Teachers today earn 17 percent less than workers with similar qualifications—skyrocketing from just a 1.8 percent difference in 1994, according to The Teacher Pay Gap Is Wider Than Ever. The report is a scathing indictment of how this country values educators, says AFT President Randi Weingarten, and “highlights the hypocrisy” of paying lip service to teaching and teachers while failing to invest in the workforce. 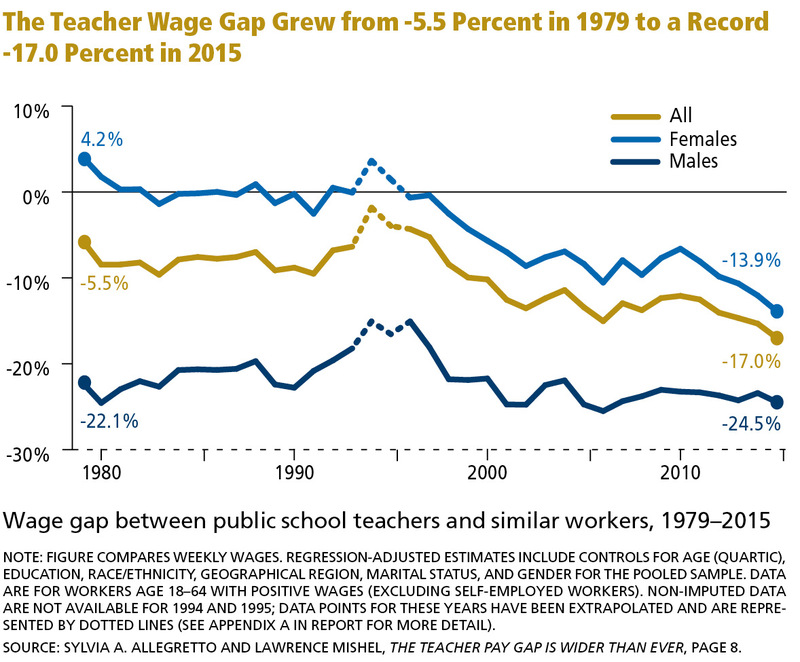 One bright spot: the wage gap for teachers represented by unions was 6 percentage points less than for those without a union.